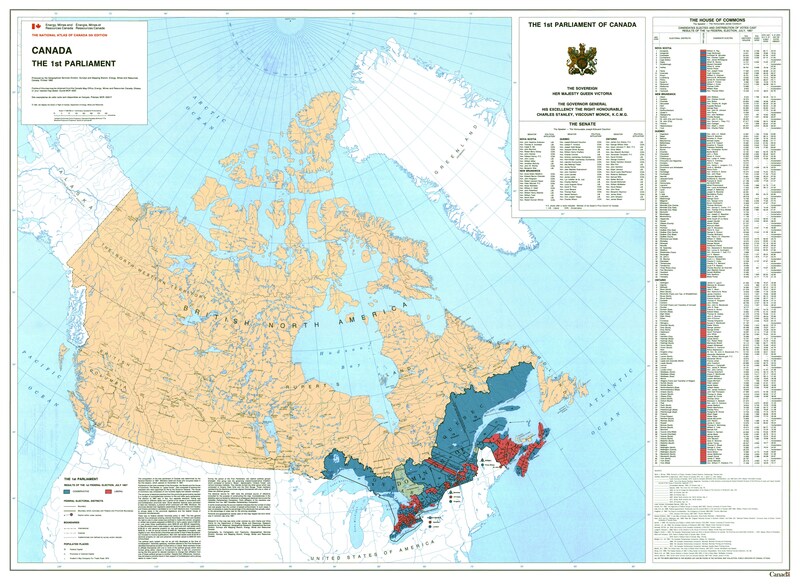 Anyhow, such research led me to discovering Canada’s old election maps. Or at least trying to. It’s pretty to find American ones, whatwith the contiguous 48 states being stable for over a century now. In Canada, where the number of seats has nearly doubled since Confederation, it’s been a slightly harder task. Elections since 1968 are well mapped, courtesy Natural Resources Canada. Once you get past that point, detailed visual riding-by-riding results become increasingly difficult to find. Yes sir, it’s “THE 1ST PARLIAMENT”, right there in the National Atlas of Canada. Boundaries shown are International, Colonial, and “Indeterminate”, which gives us the wonderful meandering division between Rupert’s Land and the North-Western Territory. You won’t find Calgary or Vancouver on the map, but you will find Fort Garry, Yale, and plenty of other outposts on the Carlton and Cariboo trails. The 180 ridings are all connected, except for Algoma, because a 200 kilometre-wide stretch of land in central Ontario didn’t need a seat for whatever reason. The Quebec riding of Kamouraska didn’t have an election because of widespread rioting, apparently over some type of family feud. Virtually all the districts were simply drawn up and named based on counties, which leads to both New Brunswick and Nova Scotia having “Kings”, “Queen’s” and “Victoria” ridings. So there’s a lot to delightful details to delve into here. There’s also a lot that seems to be, well, wrong. False. Not correct. First, let’s look at Nova Scotia. Looks like a nice mix of Conservatives/ Liberal-Conservatives and Liberals were victorious in Canada’s first election, right? Actually, a completely different party won 18 of 19 seats. The Anti-Confederation group, led by Joseph Howe, won every seat except Cumberland (taken by future PM Charles Tupper). For the next year they yelled and petitioned trying to get the province out of Canada. A House of Lords Hansard makes clear, however, that Britain wasn’t going to let Nova Scotia out. So they disbanded, and MPs chose to caucus with either the Liberals or Conservatives. That’s not what the map says. 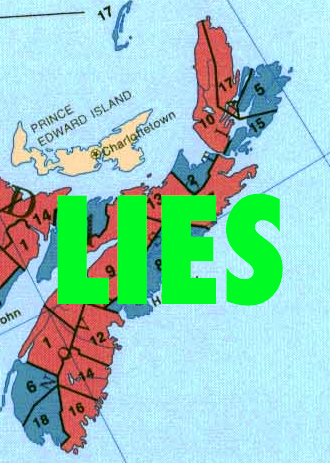 The map only says, in small print at the bottom, “Those members representing the Maritime provinces aligned themselves with one or other of [the Conservatives or Liberals].” Which is a helpful way of splitting the map in two colours, but less helpful for historical accuracy. So that’s strange. More strange is the map saying some MPs were Conservative when they were in fact Liberal. Or vice versa. In Lanark North , Storomont, and the City of Ottawa, the map says Liberals were elected, while parliament’s website says Conservatives were. In four Quebec ridings (Chicoutimi/Saguenay, Drummond-Arthabaska, Montreal City Centre, and Iberville), the map misrepresents what party the MP was with – including one, Iberville, where the MP, François Béchard, sat as a Liberal for 30 years. Why the “official” map says one thing while all other sources say another is a complete mystery to me. The map wasn’t published until 1985, so it’s possible the researchers were dealing with contradictory and scattered pieces of documents. On the other hand, it’s a reminder of the inherently messy nature of many maps. After all, the first federal election took place over six weeks. People could hold provincial and federal office. There were no secret ballots, while women, the poor, and any number of others could not vote. But on this map, it’s crystal clear, black and white – or red and blue. The official map of Canada’s first parliament may not be true, but it’s incredibly fascinating. *The Conservatives took 100 of the 181 ridings that year. Some guy named John A. became our first leader. Suppose that’s fascinating too.